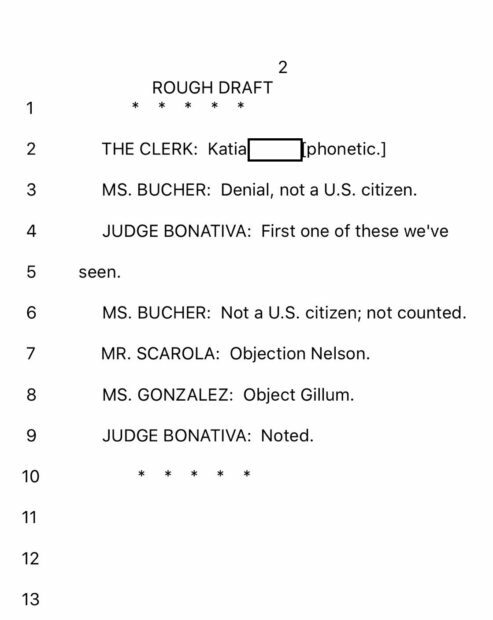 Lawyers for Florida Democratic candidates Andrew Gillum and Bill Nelson both fought to prevent a non-citizen’s vote from being excluded Friday night, according to a transcript of a Palm Beach County Canvassing Board proceeding obtained by the Daily Caller News Foundation. Michael Barnett, chairman of the Palm Beach Republican Party, told TheDCNF that the county’s canvassing board was going through provisional ballots and quickly deciding whether to allow or disallow each. This exchange is of the first non-citizen’s vote they encountered. “We had a court reporter that we hired to sit in the proceedings, which are public,” he said. The vote was disallowed despite the objections of the lawyers because two of the three members of the canvassing board ruled that it was an impermissible vote, he said. He did not explain how the lawyer, Mr. Scarola, came to be representing Nelson’s interests in Palm Beach. Barry Richard, a lawyer for Gillum, did not immediately return a request for comment. The provisional ballots are being counted as the governor’s and Senate race in Florida appear to be within the thresholds requiring a recount. Gillum is running against Rep. Ron DeSantis for governor, while current Florida governor Rick Scott is challenging Nelson for Senate. Elias is a powerhouse election lawyer who worked for the Democratic National Committee and hired Fusion GPS, which fed the FBI a “dossier” about Trump and Russia. He also litigated the recount that led to Al Franken defeating Norm Coleman for a Minnesota Senate seat. Follow Luke on Twitter. Send tips to luke@dailycallernewsfoundation.org. PGP key.